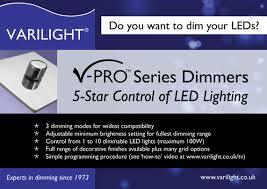 Varilight V-PRO Dimmers: Placing Timeless Possibility In Customer’s Hands! Varilight V-Pro series includes programmable intelligent dimmers and comes with an array of dimming modes for broader compatibility and adjustable min brightness setting. They are versatile and feature options of up to 300 watts. Equipped with push on/off features, these products looks are set to guarantee you maximum safety, especially if you have playful children at your home. Varilight V-Pro dimmers are manufactured using superior dimming technology in order to achieve the finest dimming performance at a given load. To optimize performance and compatibility with the ever-rising assortment of lighting options, Varilight V-Pro dimmers have been programmed, offering a choice of intelligent dimming modes. The technology allows users to set the minimum load level for their dimmer so as to optimize on the dimming range of a certain lighting load. Varilight standard V-Pro dimmers, such as Z0JP250-P , are outfitted with a push-on/push-off switching action plus rotary dimming. This is particularly important when it comes to changing the driving modes and adjusting the minimum brightness using the dimmer control’s pushes and the signals that come from the lamps. Varilight have designed their V-Pro dimmers to control LED lighting loads that require trailing –edge/ leading-edge control featuring options of 0 to120W (maximum 10 LEDs) as well as of 10 to 300W (maximum 30 LEDs). The model for the 300 watts maximum load is the MJP300 . 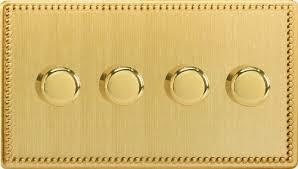 They also manufacture a range of touch/ remote control dimmers. Varilight V-Pro series dimmers, including the Z0JP250-P, are compatible with LEDs and can work with almost all dimmable LEDs. Also, they are ideal for halogen /incandescent lighting and a good number of dimmable electronic transformers. Additionally, they can work well with electronic devices having no minimum load. 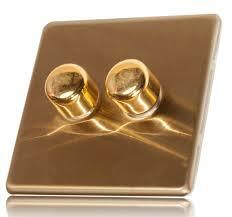 They have been designed to work with dimmers with low energy lighting. To achieve the best results with low voltage lighting, go for Varilight intelligent dimmer switches featuring Varilight electronic transformers. With Varilight V-Pro series, you don’t have to worry about the limit when it comes to the number of transformers you can use you can use since it is limitless. But, you must stay within the maximum rating of that particular dimmer. Varilight electronic transformers are ideal for regulating 12V alternate current- rated LEDs (MR16). Don’t use V-Pro dimmers with wire-wound transformers. VARILIGHT V-Pro dimmers (with high power of up to 300watts) are available in 1-, 2- as well as 3-Gang (decorative finishes) formats. You can still get them in replacement and power grid module formats. The latest V-Pro series from Varilight are low profiled, light weight, made of stainless steel material, and use the contemporary solid state technology, which ensures that they serve you for years to come. This can be seen in dimmers like the Z0JP250-P . With these smart devices, multi-stage dimming of any load can be quickly accomplished, regardless of the source of light-LED, halogen, or lamp brand. They offer smooth dimming, from full bright to complete off. To optimize performance and enhance functionality, they have been accessorized with adjustable astronomic timing, dual-zone output, and on-the-fly override. They have a user-friendly interface; this set-up is quick and easy. So, go for the best!